Crossed the Bar: Sad News reaches us that Clifford Pell 58/60 commission passed away on the 12th November 2018, after a long illness. Cliff served the Association well, spending many years as Secretary and organised many of our Veterans Reunions.. The funeral will be at Wessex Crematorium Bubb Lane, West End, Southampton SO30 2HL on November 30th at 13.45 . The HMS Ceylon Plaque has been donated to the Eden Camp Modern History Theme Museum, Malton, North Yorkshire, YO17 6RT. They were excited to receive this and will be putting on show in the museum very soon. Our Treasurer has confirmed that the Ceylon bank account has now been closed. See below the attached copies of the two letters Andrea received from the charities acknowledging receipt of our donations of over £2,900 ! A special thank you to Andrea for all her hard work over the last few years as Treasurer. Aubrey Frederick Cockayne Aston, used to serve on HMS Ceylon and I know he was with her during the Korean Engagement. 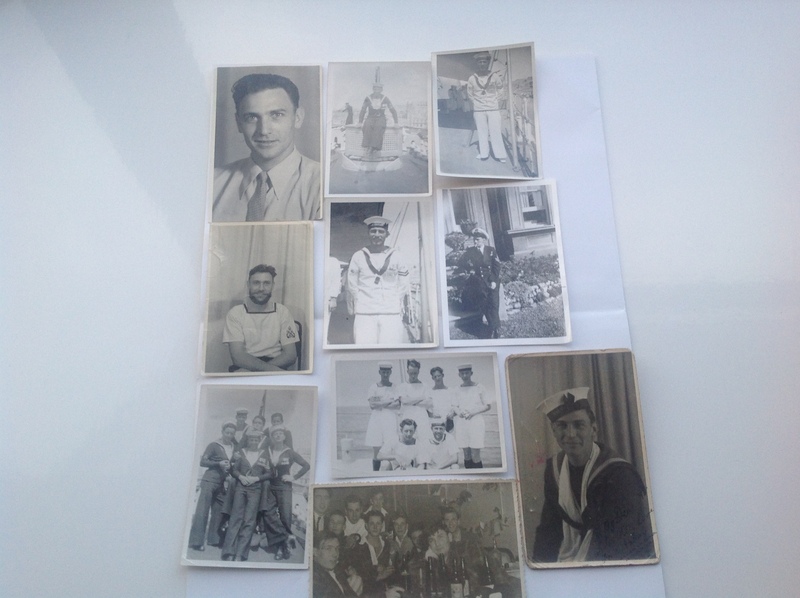 Unfortunately he died when I was about 8 months old so I’m a little sketchy on details and my Mum has had a stroke which has left her speechless but I believe he was a Petty Officer during his later years and was made up to a CPO before being invalidated out with TB, from which he subsequently died. I have just learned I have some photo albums coming from in-laws in Birmingham which show the Ceylon in action off Haeju and Chodo. I don’t suppose any of your members remember my Dad and can add anything to my knowledge of him ? Crossed the Bar: Sad News reaches us that Rodger Moorse 58/60 Commission ME passed away on the 19th November. 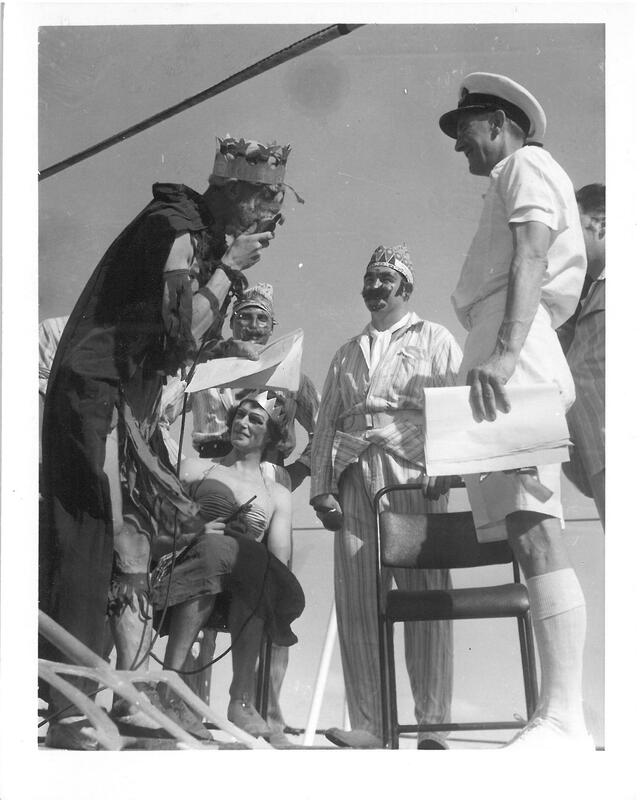 I have just been on your website and noticed you have photos of the Ceylon. My dad Arthur Ernest Edwards passed away 4 years ago this year, served on the Ceylon from 56 to 58. I have attached several photos of his crossing the line ceremony the crossing the line certificate. The treasury has now closed the books with the help of John Wyeth who countersigns the cheques with me.The total amount in our accounts is £5972.35 which is to be divided between the Royal Naval Benevolent Trust and the Royal Marines Charity, as proposed at our last Annual General Meeting. Crossed the Bar: William Rice [Bill] on Friday 8th September 2017, aged 93 years. Signalman. Bill was on the Ceylon during World War 2 with the Pacific Fleet, his daughter said he often spoke of the times aboard Ceylon, after he left the Royal Navy he worked for Cable and Wireless in London, he had a long and happy retirement and enjoyed a game of golf which he was still playing aged 90.Perhaps some of the 1st commission, maybe some members can remember him., he was in the signals department. Terry was a great lover of military history. 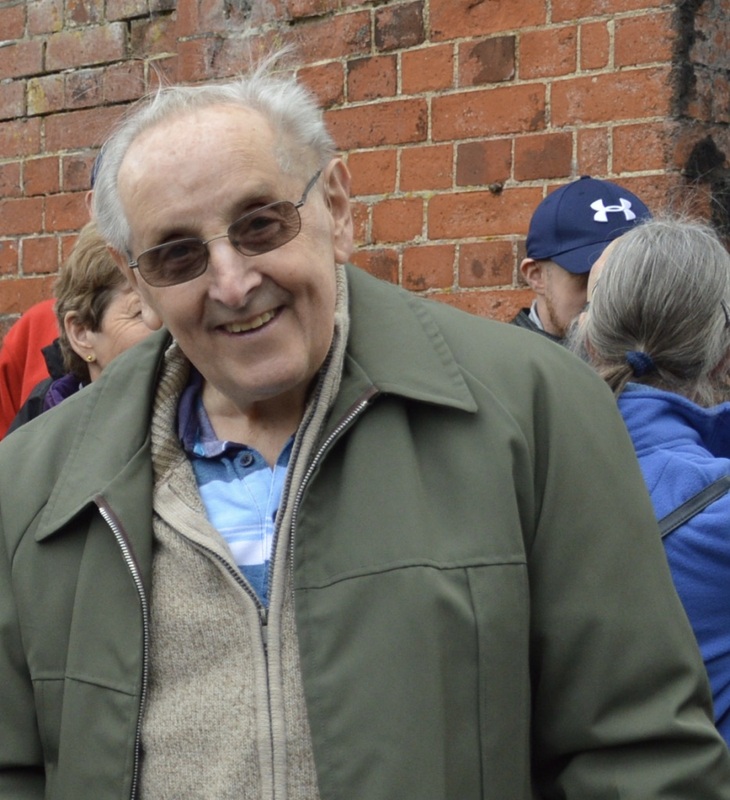 He was an evacuee during WW2, and he later enjoyed going to the annual reunions of those who shared that experience with him. 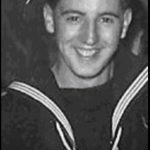 It was always Terry’s ambition to join the “Andrew”, and after qualifying as a Quarters Armourer, the highlight of his career was his service aboard HMS CEYLON h during the Korean War. (1950-52). The current edition of Korean Veterans Newsletter carries a copy of Terry’s account of those years, that was kindly made available by the HMS Ceylon Association. In 1954/55 Terry joined HMS GLASGOW (Flagship of the Med Fleet) on a General Service commission. 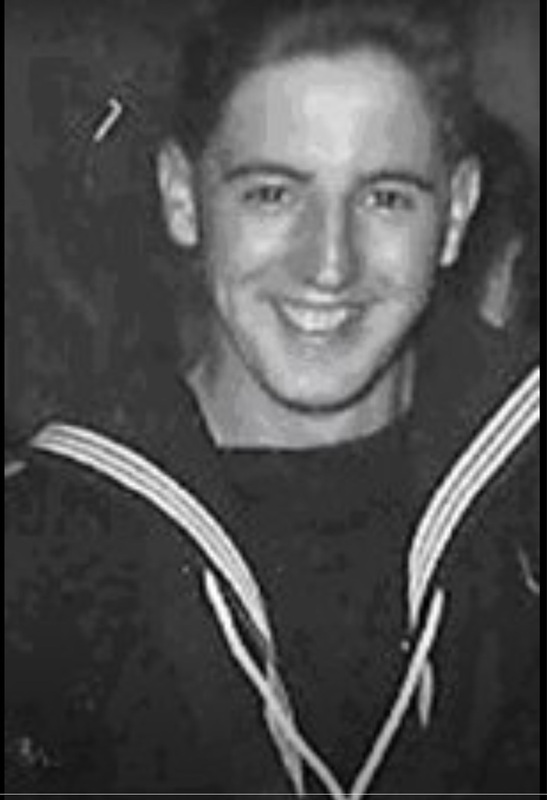 Leaving the Navy in 1956 he was employed until retirement as a member of the security team at the Ford’s Transit plant in Southampton. 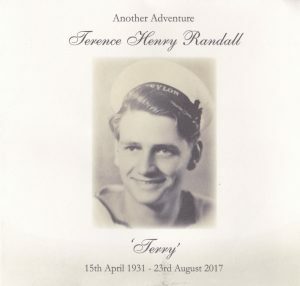 He leaves his widow Barbara, while his son (also a matelot) still retains Terry’s Korean links as an honorary member of the local Association. My father, Aubrey Frederick Cockayne Aston, used to serve on HMS Ceylon and I know he was with her during the Korean Engagement. 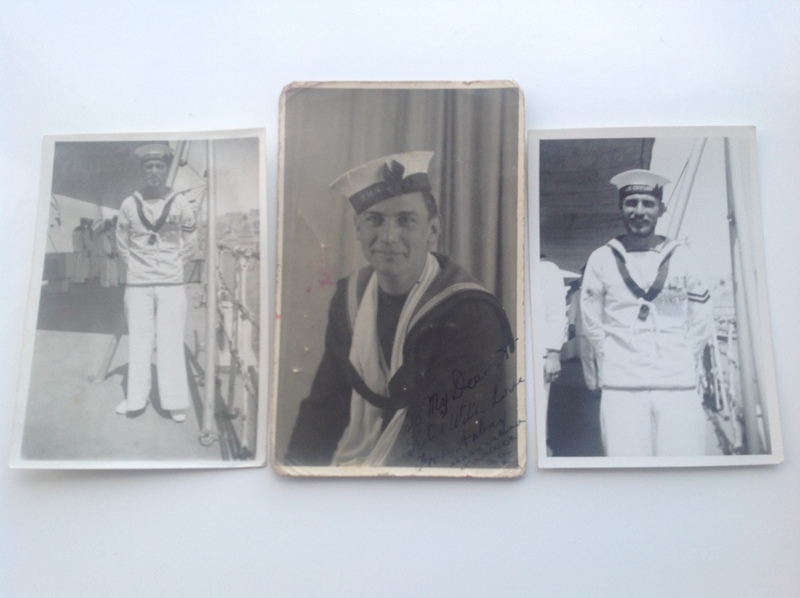 Unfortunately he died when I was about 8 months old so I’m a little sketchy on details and my Mum has had a stroke which has left her speechless but I believe he was a Petty Officer during his later years and was made up to a CPO before being invalidated out with TB, from which he subsequently died. I have just learned I have some photo albums coming from in-laws in Birmingham which show the Ceylon in action off Haeju and Chodo. I don’t suppose any of your members remember my Dad and can add anything to my knowledge of him ? 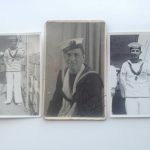 Terry served aboard HMS Ceylon from 1950 – 1952, Leaving the Ceylon Terry served aboard the Carrier, Ark Royal, the Cruiser Glasgow and was loaned to the Destroyers, Finnisterre and the Sluys., which were the ‘live firing ‘ ships for HMS Excellent’s men under training. Leaving the service Terry joined, as a policeman, the Southampton City Police, during this time he was awarded a medal for saving a man from drowning, the man’s car had gone into the water in Mayflower Park, Terry dived and brought the man to the shore. Leaving the Police, Terry had a job in London working with Teleprinters which meant commuting to and from London each day., Leaving that job he worked at Standard Cables in Southampton, much nearer to home, finally he worked for the Ford Van works in Southampton on the Security staff. The funeral took place at the Wessex Vale Crematorium, West End, Southampton, on Tuesday 12th September 2017. 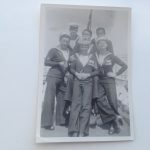 There were many attending, some from the many Associations of which Terry was a member, namely the Royal Naval Association, Korean War Veterans, HMS Ceylon Association and an Honorary member of the Normandy Veterans Association , the place was full with many standing. The Normandy Veterans Flag, and , the Koreans Veterans Flag were in attendance. although many could’nt make it in time due to traffic hold ups, even though the Service was delayed for 30 minutes. The family provided excellent refreshments after the Service, in the lobby, which was much appreciated by all. I wouldn’t have known about it, if I hadn’t received your newsletter (Volume 5) and Joyce’s article about the medal. other Crown Colony class cruisers. The Republic of South Korea Ministry of Defence request the names of all surviving veterans who served in the Korean Campaign. 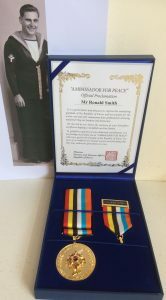 Ken Keld a founder member of the British Korean Veterans Association is acting as co-ordinator for the North East area in conjunction with the Korean Liaising Officer tracing all veterans who served in Korea. At the present time he does not know the reason or reasons for this request but he can assure you from his own personal experience the people of Korea are grateful for your part played in securing freedom for their nation, in their eye you will always be their hero. 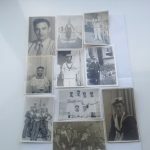 This appeal, due to age factor, could in some cases be a problem but should sons, daughters, grandchildren or even friends who know of any such veterans please contact Ken Keld on their behalf, but only with their consent giving all their relevant details – present postal address, telephone number (if possible) or even email, plus all service details. For those who use the postal service and require any further information or a reply, please enclose a stamped addressed envelope in all cases as this is being done on your behalf on a voluntary basis. All your replies will be strictly confidential. I served as an ERA 1st Class on the 1958 59 commission under Captain Peter Twiss and still have the magazine from the commission. I am not sure if you have any members from this commission but would be interested to hear from you. 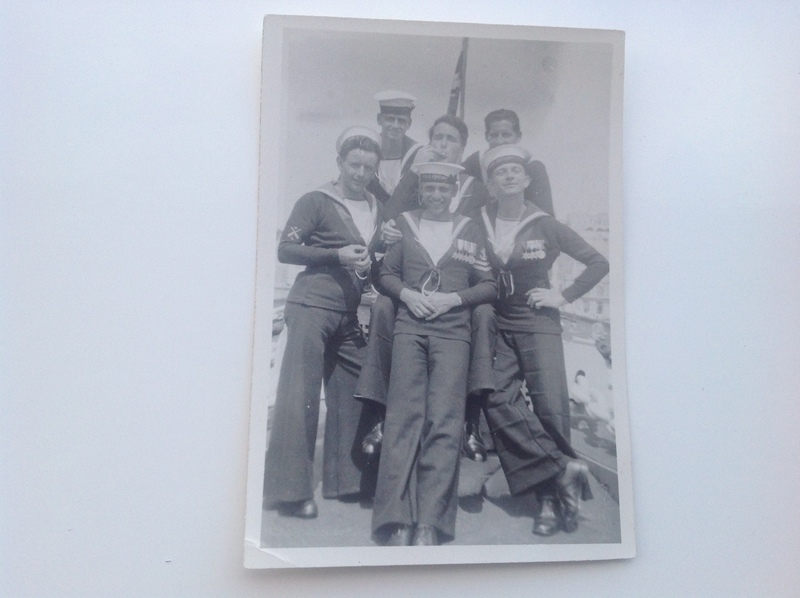 My father Ronald Maxwell served on HMS Ceylon 1943/44. He died on 18th March 2016. 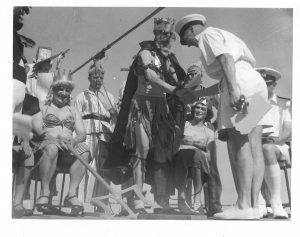 Although he experienced the traumas of war like many others, he had fond memories of his time on HMS Ceylon. He was one of the first to board her in 1943 at Greenock in Glasgow. Although he told me some tales of his time in the RN it was always the light hearted times he. referred to. I wish now I had talked to him more. My Grandfather Lawrence Geoffrey Coleman served on the Hospital Ceylon during the second world war, he sadly passed away around 14 years ago now but he was my hero growing up and I still miss him to this day. He left a large happy family behind and my father is a lot like him and it’s with their teachings I have had a good life. 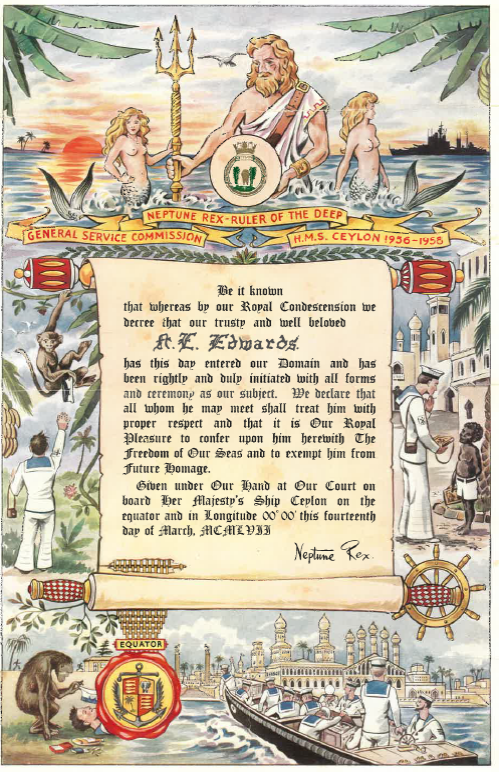 The reason for this email is I would like my family to know some people who knew my Grandfather are still around and I would like to know more about what happened in the war aboard HMS Ceylon. 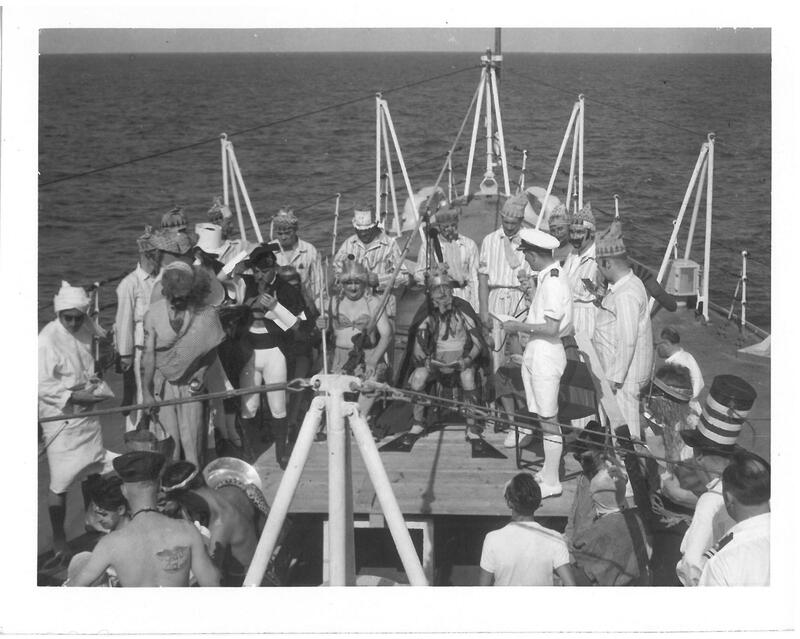 We have a few photos at home of Lawrence on the Ceylon, one of which my favourite is my Grandfather and fellow crew holding a Japanese flag after a surrender. I guess any information you have I would be over the moon, I have not told my dad of this email as I want to surprise him. I got a draft ship to the East Indies station based in Trincomalee on HMS Ceylon for 2 ½ years. I joined my ship HMS Ceylon a cruiser in Singapore where she was having a three month refit. On completion we then took our station in Trincomalee. 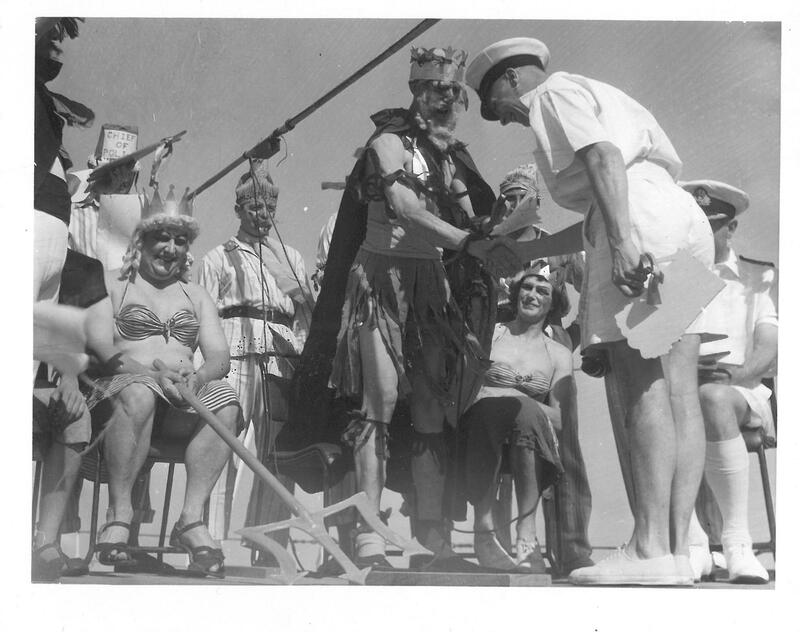 In 1953 we escorted the Royal Yacht SS Gothic for the royal tour of Australia, New Zealand, and Tasmania. A good time was had by all, on completion we escorted the royal couple to the Coco Islands where we left to go to the Maldives to witness them becoming a republic, then back to Ceylon. We spent the rest of the commission showing the flag cruises to East Africa, India, Pakistan, Persian Gulf, Vietnam, Seychelles, Fiji, Zanzibar, and a few more. 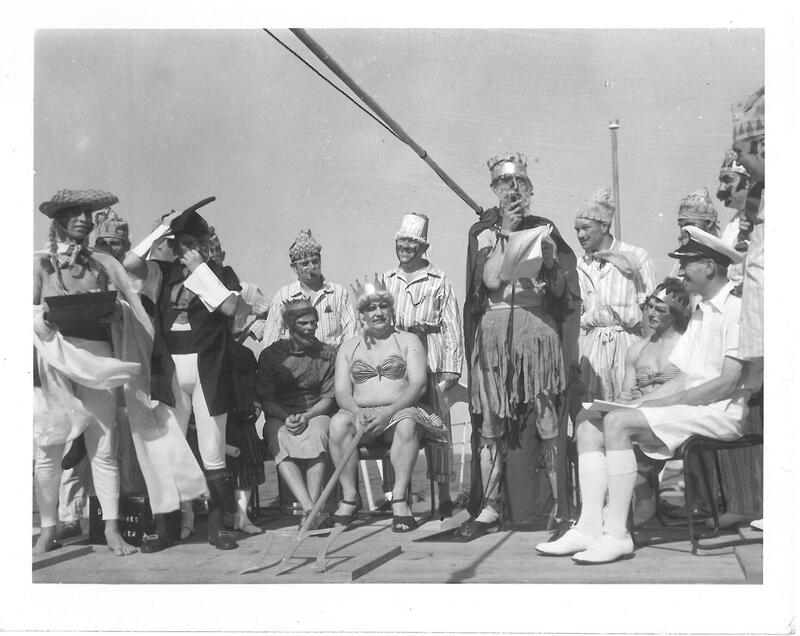 We paid off in Trincomalee in late 1954 to Portsmouth. Sadly my dad passed away at the age of 81, last month of a heart attack at Colchester hospital in Essex. It was all very sudden and unexpected. I would very much appreciate it if you could perhaps pass the above information onto anyone who might like to come and say goodbye to my dad. I know Essex may be a distance to travel to but if anyone who knew my Dad would like to attend his funeral it is on Wednesday 24 February at Weeley Crematorium in Essex at 3.30pm. I have created this email address ron.joy@hoof.me.uk for any correspondence relating to my dad.